Amy Weiss is a curatorial assistant in The New York Botanical Garden’s William and Lynda Steere Herbarium, where she catalogues and preserves plant specimens from around the world. As one of the first scientists to be associated with The New York Botanical Garden, Henry Hurd Rusby started the botanical garden’s long history of research in economic botany, the study of how people use plants. Appointed Honorary Curator of the Economic Collections in 1898 (a position for which he volunteered and which he held until his death), Rusby acquired useful plants and plant-derived products through donation, exchange, and field excursions for the garden’s Economic Museum. 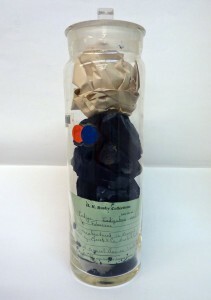 These specimens were arranged first by use, then by phylogeny (their evolutionary relationships), and were put on display at the turn of the 20th century on the main floor of the newly built museum building, which is now called the Library Building. The collection occupied more than 200 glass cases. Rusby placed great emphasis on ensuring that each item in the museum have the correct origin and scientific name. That’s standard practice today, but at the time many specimens lacked these important pieces of information. 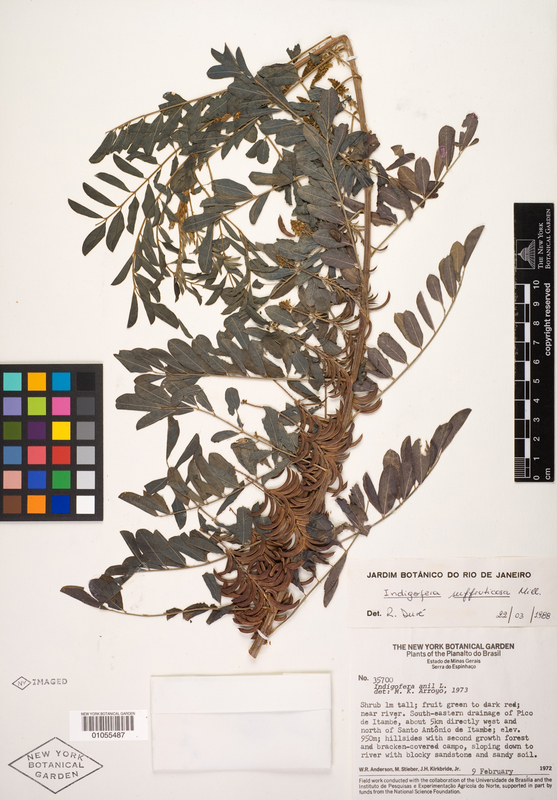 Rusby died in 1940, and as research into the classification and description of plant species grew in importance, the museum was eventually dismantled to make room for the growing herbarium, the garden’s scientific collection of dried plant specimens. In a seldom used area of the William and Lynda Steere herbarium, one can still view Rusby’s economic museum, no longer in fancy display cases but no less impressive. Wandering the aisles, my eyes were drawn to a jar that appeared to be full of melted lumps of blue crayon. 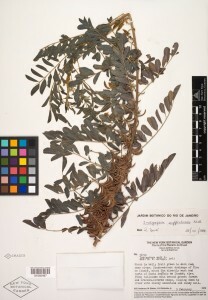 The label identified it as number 1295, a collection of indigo dye produced from Indigofera anil, a plant species in the Fabaceae, or bean family. This species is currently recognized as Indigofera suffruticosa, which is native to the tropical and subtropical Americas, but it has been introduced around the world. This particular collection was manufactured from cultivated plants grown in the region of Bengal. Indigo dye has been used extensively by cultures throughout history, but most people today know it as the color of denim jeans. Despite its natural origin, nearly all indigo dye is now made synthetically. For further reading about H. H. Rusby and his impact on the NYBG, visit this article on SpringerLink.